Began martial arts in 1995 by taking Judo and Sambo during his study at Lugansk Institute of Internal Affairs (Police Academy). Began his study of Aikido in Ukraine in 1999 under Roman Limarev Sensei, 5th Dan. 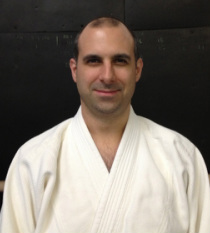 Has been studying and teaching Aikido in NYC under David Fryberger sensei, 6th Dan guidance since 2004. Invites everyone to come and discover Aikido as a traditional, beautiful and powerful martial art of self-defense.